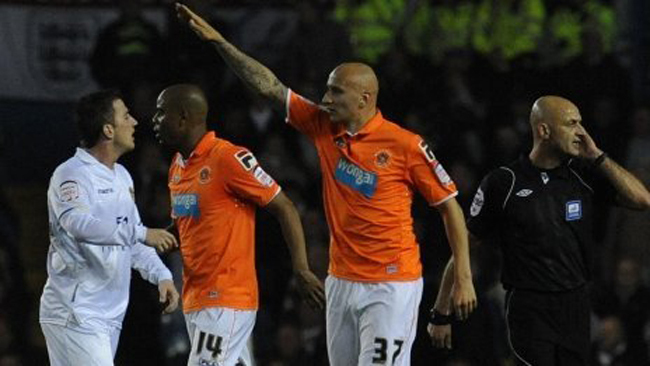 Snapshot: Blackpool’s Jonjo Shelvey In New Nazi Salute Outrage? Well, one imagines it wasn’t a Nazi salute. In the same way that Robin van Persie’s wasn’t. Still, Shelvey, on loan from Liverpool, surely deserves the same kind of silly criticism that the Arsenal man received following his goal celebration at Stamford Bridge? Look at him, the big goose-stepping, Third Reich-sympathising baldy. As for the game itself, Shelvey netted a hat-trick in Blackpool’s 5-0 mauling of Leeds at Elland Road, which you’d assume will do his long-term hopes of making it at Anfield the power of good. Isn’t he just waving and been photographed halfway through raising his arm? looks more like a crazy dance move between Shelvey and the Referee (who looks very much like Jonjo….spooky!) in an early 90’s “Right Said Fred” style!! lol!! What makes it worse is that he’s a skinhead. Funny there are three skinheads in that photograph. Luis Suarez approves of this. Haha. I shave my head and im i big white dude. You have to be careful about gestures like this lol.